Born in 1933 in Darlington, South Carolina, Frank was interested in anything with a engine though by trade he was a carpenter and a builder. He went to a modified race at Columbia when he was in high school and decided to race. 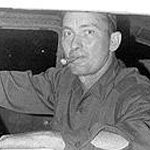 He started racing in 1956 with a 1937 Ford with a flat head engine at Sumter Speedway which was carved out in an old pasture just outside of Sumter, South Carolina. Bye Laws of that time prohibited commercial sporting events on Sunday's so the racing was free but you had to pay to park (which was legal). It has not mattered what level he has been a success. He got his first win at the old Darlington dirt track. In the late-1960s he ran a Chevrolet Camaro on the NASCAR Grand Touring/Grand American circuit. From 1968 through 1971. He took one victory, on June 1 1969, in the GT 300 held at Richmond International Raceway though it was not confirmed until after a 3 hour scoring re-check. He was 19th in the boycoted first Winston cup race at Talladega and 4th in the Paul Revere 250 at Daytona in 1969. He won the Turkey 250 at Fayetteville NC and was second to Ken Rush in the Grand Touring Division season championship tht#at year (1969). He competed in five NASCAR Sprint Cup Series events in his career, earning two top-tens. He made his debut in 1962, when he competed at Columbia and Myrtle Beach. In 1969 he ran at Talladega and made his final two Sprint Cup appearances in 1971 finishing 9th at Macon and 8th at North Wilkesboro. In 1972 he also raced 6 times in the Grand National East Series with a best result of 4th at the Columbia Speedway. he also had 3 top ten finishes. In September 2004 at the Florence Motor Speedway in the Late Model feature race Sessoms got off to a slow start from the third row. However he ran a strategic race, picking off the competition to taking the checkered flag to add another feature win to his racing resume. Frank raced for the thrill of it for 6 decades during which time he raced against 3 generations of Earnhardts and beat them all. he also held a private pilots licence. He died at age 75, at his home in Darlington, SC. The long time racer and car builder won his last Championship at Florence Motor Speedway in 2002.